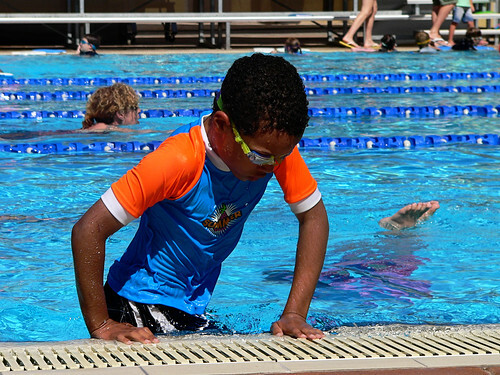 For the last couple of years I’ve had this time of year off and taken JJ to VacSwim – a government funded swimming program. 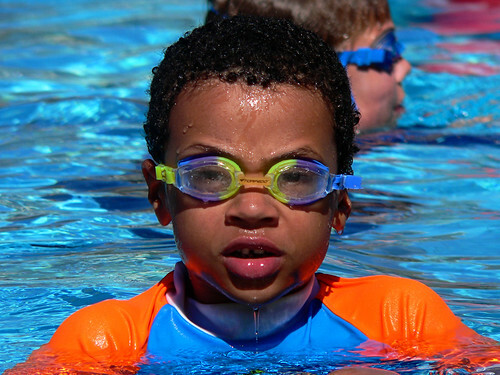 It gives him the chance to spend a concentrated amount of time learning how to do swimming strokes and he also learns some water safety. Last year he couldn’t really touch the bottom of the pool at the shallow end, 1.2m, and this year he has no problem touching the bottom. As if I needed this confirmation that he’s grown – the clothes and shoes that no longer fit can attest to that. This year it’s also a bit of a struggle to get him changed. He’s just that bit too young to go and do it all by himself in the boys changerooms – showering, getting wet things off, and just being by himself in there. And he’s too embarrassed to come into the girls changerooms with me because he doesn’t want girls seeing his bits. We compromised. I took him into the girls changerooms and we went into a cubicle with a door. Today was a bit cooler so even though I had my bathers on I didn’t go for a swim with him afterwards. JJ is pretty confident in the pool and water and I wish he’d listen more to the teacher as I wonder if he’s not a bit over-confident, but some things sink in and he really enjoys it and I know he benefits. Your boy looks wonderful in those goggles, and he looks pretty comfortable in the water too. It’s such a good thing that he likes it Jen…it’s really important that he does well around water….I was always a little paranoid until all of my kids became good in the water. My son was afraid of it when he was very small, but learned to really love it. JJ really looks like he’s grown a lot. Great pictures of him. That water looks very inviting…. 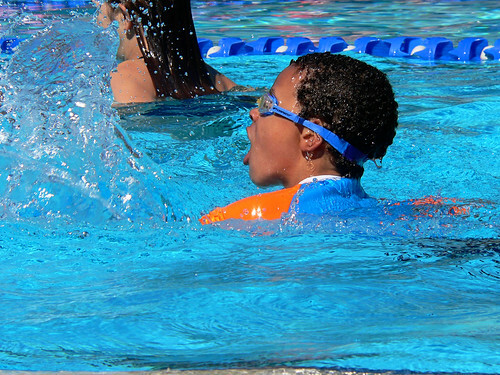 Swimming is such a great activity! I grew up with a pool and we were taught to swim as soon as possible – and I made sure ‘Salina did too – luckily, as she is quite a fish. He does look very confident. He will be fine, I am sure. Wish we had such things available here. Mind you, boogie boarding and body surfing are making up for deficiencies in pure style. He gets quite a bit of sea action too and I must get him a boogie board. Perhaps I’ll get us both one.